TechRadar has found it very hard to concentrate on anything but Mario Kart this week. For once, the pre-release hype about a game is more than well-deserved. The problem, of course, is that we now have Wii disconnect anxiety – sinking into a mild panicky depressed state at the mere thought of being away from the joys of Mario Kart online battles for too long. Hey presto! 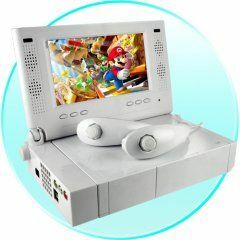 Chinavision has just launched its new portable Wii screen, pictured here, so we can finally play our Wiis on the go. It’s ideal for keeping the kids quiet on long car-journeys (it comes with an in-car adapter) and for taking on family holidays and will set you back a mere £52. Chinavision’s new Wii screens are available online now.